Whether you call them Pop-Up Books or Moveable Books, there's no doubt that books with elements that pop up, slide, twirl and change before your eyes are just plain fun. And fun is the general idea behind this great collection of books recently given to FAU Libraries by Arthur J. Williams. 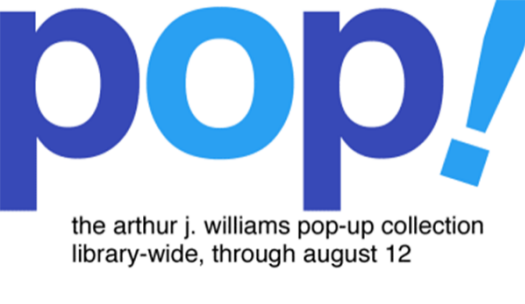 The Arthur J. Williams Pop-Up Collection is comprised of 425 pop-up and moveable books, and the collection has found a perfect home at FAU Libraries' Jaffe Center for Book Arts, where it is permanently housed, enabling students and researchers an opportunity to study the mechanics of pop-ups. More importantly, the collection offers a chance to explore books that are just plain fun. The exhibition will feature as many books from the collection as we can possibly fit into our cases. from. Related programs include paper engineering workshops with book artists Shawn Sheehy, Carol Barton and Colette Fu, as well as a gallery talk by paper engineer Matthew Reinhart, one of the most prolific artists currently working in the moveable book field. We're also screening a film that probably would have made an excellent pop-up book: "Pee Wee's Big Adventure." We're serious about the "fun" part. This exhibition is accessible in the public areas of the Wimberly Library (First Floor Main Lobby and Third Floor JCBA Lobby). Regular library hours are Monday to Thursday 7:40 AM to 2 AM, Friday 7:40 AM to 6 PM, Saturday 10:30 AM to 6 PM, and Sunday, Noon to 2 AM. From I-95 or the Florida Turnpike, exit Glades Road, east. The FAU campus is located just east of I-95 on the north side of Glades Road. If you enter the campus at FAU's main entrance (the one furthest west on Glades Road... and the first one you get to approaching from I-95 or the turnpike), you will enter on West University Drive (formerly Broward Avenue). Continue straight on West University Drive to the traffic light at its intersection with Volusia Street. Turn right onto Volusia Street. You will see a parking garage on Volusia Street, and the Wimberly Library is the next building east of the parking garage. Visitor parking is available in the library parking lot. The metered system accepts cash and credit cards at the rate of $1 per hour. The Arthur & Mata Jaffe Center for Book Arts. Wimberly Library, Room 350 Florida Atlantic University 777 Glades Road Boca Raton, Florida 33431 Telephone: 561.297.0226.